Outside of art classes in high school I've never faced a deadline for completion of any of my artsy or crafty adventures. Like many artist (dare I call myself an artist? ), but anyway, like many artist I work at my own pace which can at times be no pace at all for long periods of time. Obligating myself to 5 people with a promise to create something homemade for them was the best creative boost I've ever experienced! I unleashed my creative bug and before finishing the first gourd in the Great Gourd Giveaway I was already working on the next gourd in my head! 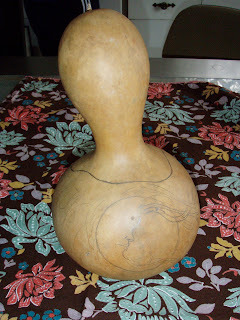 Working on a gourd in my head first involves staring at the gourd. Yep, I fill up my eyes with long stares of the gourd in waiting. 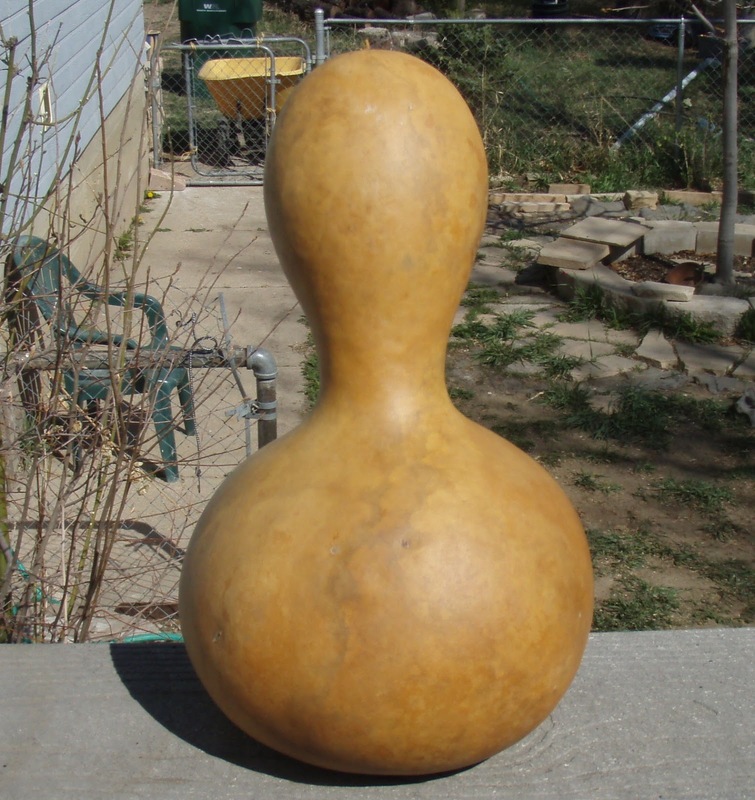 I also get a physical feel for the gourd. Each gourd has a unique texture and thickness which will influence all the work done on it so I run my fingers all around the gourd getting to know its texture. As I put the last dabs of paint and sealer onto the gourd I am finishing, the next gourd is close by whispering images into the air that I breathe in and digest. The gourd in the photo above is cleaned up and now awaits my next encounter with it which will involve a pencil. 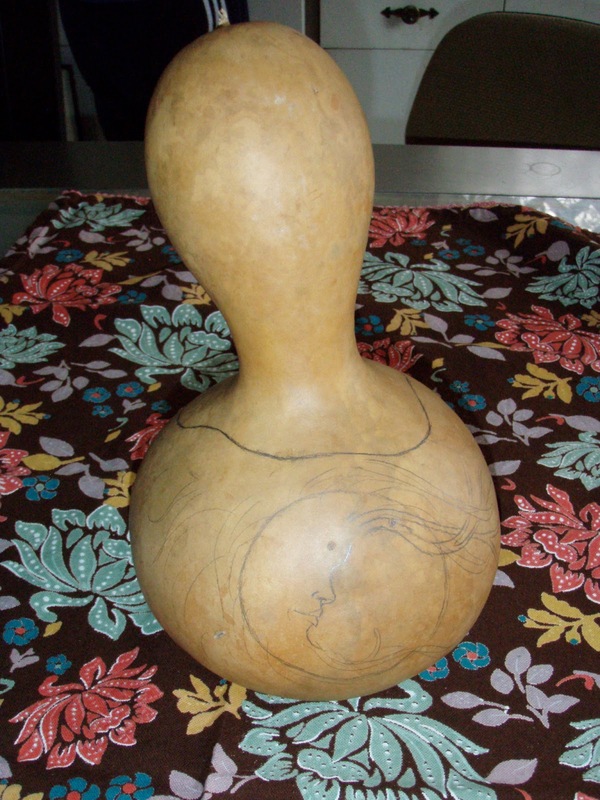 When I know a little bit about the gourd's soon to be owner I use that information in guiding my ideas. I will ask about favorite colors and plants and places and poets to open up a path of communication. It is in the communication that I often get my inspiration but that inspiration is not from knowing someone's favorite color is purple or green but rather the inspiration flows in how the information exchange happens. You can get to know a lot about a person in how they talk about themselves more than what they say about themselves. 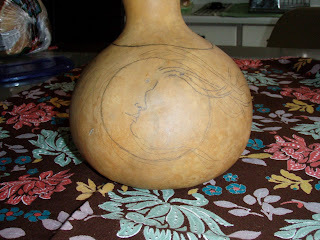 The photo above shows the image that was persistent in my head each time I touched the gourd and or talked with JB. 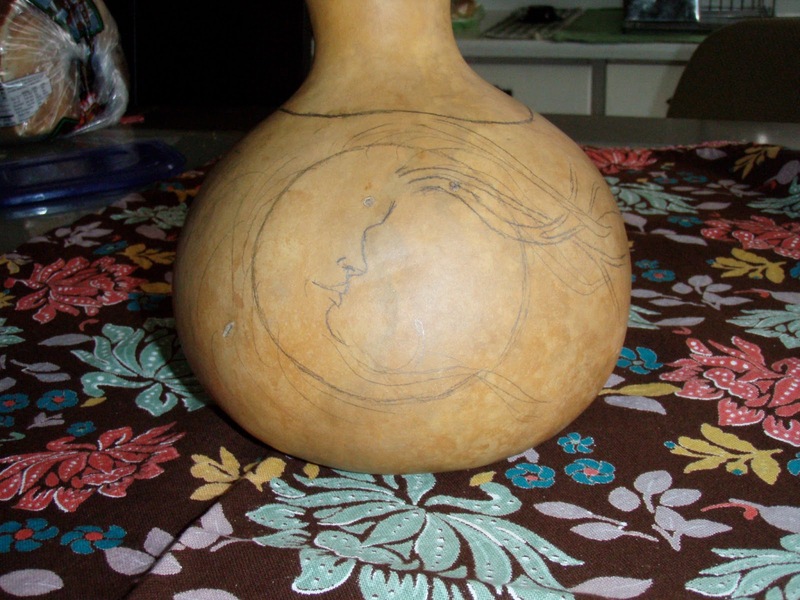 The gourd was to be a moon gourd! 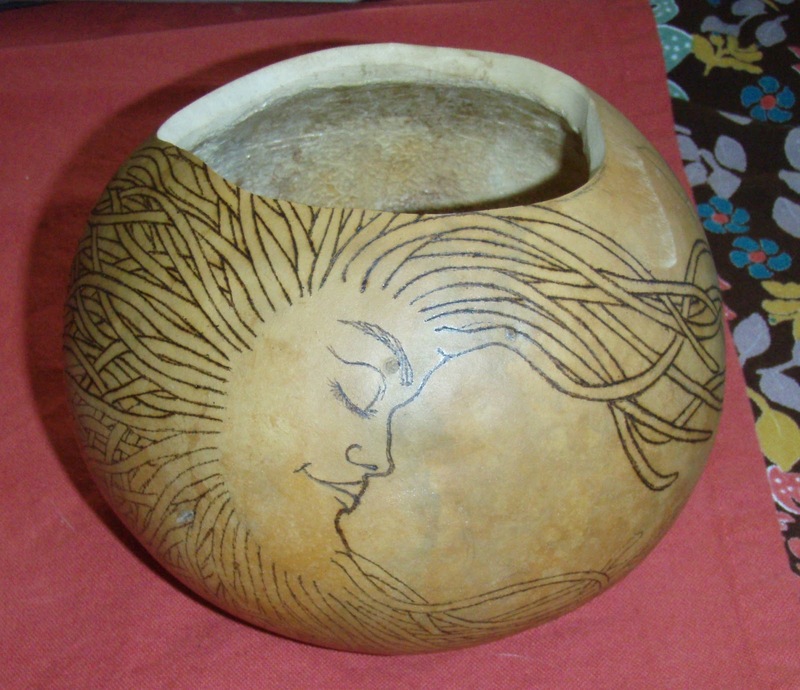 I love the moon :-) The moon is an iconic symbol that is loved by many people, revered by many cultures, and our Earth's moon is loved and honored by the owner of this beauty, so I was not surprised when I kept seeing a moon when I touched the gourd and hearing the words La Luna. You can see where I have sketched out the basic moon shape and will do more detailed work once I have cut the top off the gourd. In this photo you see where I have used a jigsaw to top the gourd creating a bowl! With the gourd cut I scrape out the insides which are comprised of seeds and gourd fluff that is somewhat like styrofoam and flaky skin! Drawing the design in more detail is very relaxing for me. Although I am relaxed while drawing I have to be very cautious that my fingers to not erase what I draw! I discovered the hard way that graphite rubs off the gourd's body easily if I am not careful. I love the smell of the burning tool searing the gourds shell! In the photo above you can see I have begun to burn in the moon. This is when the design is set and cannot be changed because burn lines cannot be erased or rubbed out and even if painted over there is still the depression from the burn line. Burn is burn and there is no such thing (or word!) as un-burning! 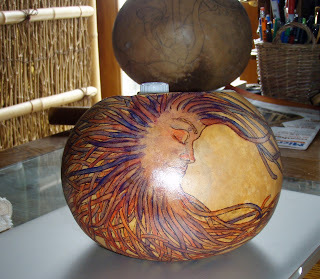 Part of the thrill, for me, while working with my gourds is knowing I have to be accepting of my work for there is no changing it once I begin using the pyrography tools. 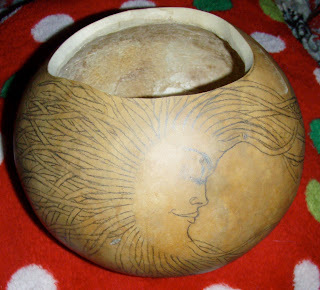 The recipient of this gourd is a beautiful soul who is a visual artist and poet. 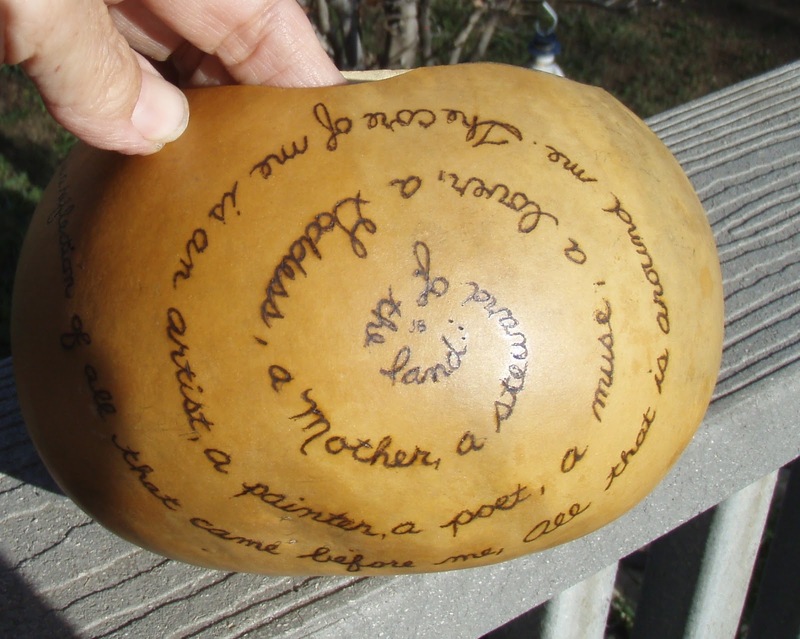 I had noticed in one of JB's blogs a beautiful poem they wrote so I used the poem as part of the gourds expression. it's rare when someone describes their artistic process, and i just love it when they do. thank you for that, maryanne. i take great inspiration from that. these gourds are exceptionally beautiful and even more beautiful because of what you're doing with them!